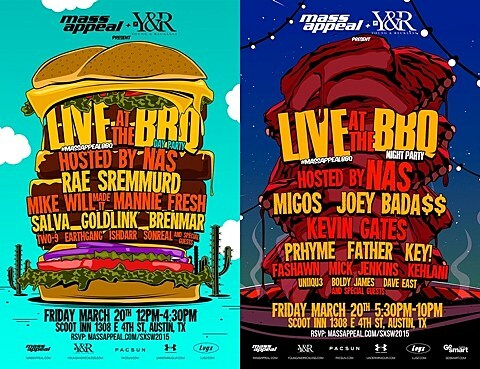 Nas’ imprint Mass Appeal is hosting an all-day BBQ during this year’s SXSW, and of course the food comes with a hefty helping of stellar hip hop talent. There’s a day show and a night show at Scoot Inn on Friday (3/20), both hosted by Nas himself (although it doesn’t appear he’s performing). You can catch Rae Sremmurd, Mike Will Made It, Mannie Fresh, Salva, Goldlink, Brenmar, Two-9, Earthgang and Ishdarr at the early party; and the night party hosts performances from Migos, Joey Bada$$, Kevin Gates, PRhyme, Father, Key!, Fashawn, Mick Jenkins, Kehlani, Uniiqu3, Boldy James and Dave East. Both parties are free with RSVP.